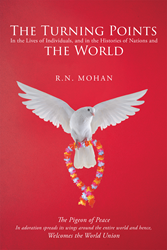 Recent release “The Turning Points: In the Lives of Individuals, and in the Histories of Nations and the World” from Page Publishing author R. N. Mohan is the continuation and end of the series discussing the destiny of the world. R. N. Mohan, a globally renowned mathematician, has completed his new book “The Turning Points: In the Lives of Individuals, and in the Histories of Nations and the World”: a fascinating conclusion to a series that delves into what will be the decisive destiny of the world. Published by New York City-based Page Publishing, R. N. Mohan’s insightful work explores the tremendous evolutionary modifications in the life phenomenon and turbulent changes in the world’s political and social phenomenon, and all that constrains any rational thinking man to dwell in thoughts like: what would be the destiny-manifest of the whole of the humanity and for the world entire in the future? And the most perplexing and intriguing question is: what would be the epitome of this evolutionary phenomenon in any aspect either human or in the world political and social as well? In the flow of the human life, the thinking and behavioral patterns, there are numerous “Turning Points” that are occurring all the while from the time immemorial, changing the facets and fortunes of man, and so even the history of the various countries and of the whole world as well. Then what would be the ultimate and sublime turning point, the most final, for the whole of the humanity and for the entire world in the coming future that will be the decisive destiny of the world, which will be addressed in this tiny volume. This will be the end of his series consisting of two other earlier publications namely: “Mind a Miracle: Man Magnificent” and “Humano divino: The Decisive Destiny of Humanity.” by the same publisher. Readers who wish to experience this tremendous work can purchase “The Turning Points: In the Lives of Individuals, and in the Histories of Nations and the World” at bookstores everywhere, or online at the Apple iTunes store, Amazon, Google Play or Barnes and Noble.